Masa is a newish entrant into the high-end Japanese dining scene in Taipei that's been garnering rave reviews online since opening in late 2006. Located on the noisy and busy thoroughfare of Civic Boulevard near Dunhua South Road, Masa's stark white interior caught my eyes immediately when it opened. Somehow it's a year and a half later that I've finally made my way there for a tasting. First, the good: The sushi served that night was impeccable as were the cooked dishes. I can see how others might be impressed. Where they faltered was unfortunately everything else: the pacing, the selection, the service and even the amount of food. Each misstep is small enough to overlook, especially in light of how good the sushi was, but details like these are arguably more important in haute sushi than in other cuisines. As is the case at other high-end sushi joints in the city, Masa has no menu. However, instead of giving a rough estimate of how much a meal would cost and then tallying up your bill at the end depending on what you actually ate, as is the norm for this class of sushi restaurants in Taipei, you are given a choice of a NT$1400/US$45.25, NT$2200/US$71.11 and NT$3000/US$96.97 set menu. I decided to try the middle option as I was informed that the one below that does not come with uni, a must for me at any proper sushi meal. The reason the bar seats at a sushi restaurant are so highly sought after is the fact that you get to interact with the chef and receive a meal tailor made for you. Sure it may be a set menu, as it is here, but the chef has a degree of flexibility in selecting from the day's ingredients to match a particular diner's tastes and appetite. Not so at Masa. I was served the exact same meal as everybody else who ordered that $2200 option that night. There was absolutely no personalization for me. I even specifically told the waiter (yes, waiter, even though I sat at the bar, the chef did not take my order) I did not want salmon. And lo and behold, salmon appeared during the nigiri portion of the meal. I protested and the chef mumbled something about it being not just any salmon, but a special one so it didn't count. That made no sense, but okay, let's see how special it was. As it turned out, it was just a regular piece of salmon! Nothing special about it whatsoever. This was the first time I've been served something I specifically asked not to be served in a serious sushi restaurant. They are so rigid in their menu that they could not substitute one piece? Unbelievable. Along with the salmon, that course also came with a piece of regular tuna and a (I must admit) rather delicious hamachi that's been finely scored. While the salmon and tuna were extremely fresh, they seemed out of place for this type of meal. Usually if an expensive sushi restaurant tried to serve such common pieces, they would at least make the effort to dress them up somewhat to hide the fact that they are serving you cheap sushi. Of course, it wasn't all low-brow sushi. In fact, other than those two pieces, everything else was every bit what one might expect from a fancy sushi meal, which made the appearance of those two even more jarring. There was a fantastic lobster sashimi with a drop of yuzu juice and an otoro nigiri that is to die for, to name two. The chefs, as mentioned, did not take our order and basically did not interact with us the entire meal. They would put pieces on our plates and just walk away quickly, sometimes muttering what they were, sometimes not, and never staying long enough to gauge how we were or were not enjoying them. The pacing was very erratic, we would go for long periods with no sushi on our plates as the chefs were busy constructing the set menu for all the table guests. The prix fix menu's final short-coming (and it was a big one) was that there was just way too much food. Probably twice as much as was reasonable. Aside from the plentiful sashimi and sushi and all manners of small dishes (some quite good, I might add) that punctuated the procession of raw fish, there was a salad, a soup, noodles, and two hot dishes. I had a big appetite that night and I was feeling extremely uncomfortable towards the end as the dishes just kept coming and coming. I found myself resenting the seemingly never-ending succession of dishes (it is a terrible thing indeed to make a foodie hate food). Don't they have a concept of what a human stomach is able to hold? The grilled fish towards the end was big enough to stand as a meal all by itself. I'm sure this is a concession they feel they must make in order to survive in Taipei's market. If they are perceived to not offer "value" for the amount they are charging they're not going to thrive. This is the sad state of the Taipei restaurant scene. It's unfortunate as I much prefer to receive fewer dishes in exchange for higher-grade ingredients. Finally, they are overly in love with yuzu flavoring here. It works fantastically in some (a dab on some sashimi pieces, like the lobster I mentioned earlier, and as a dressing component for a white asparagus hors d'oeuvre), but not others (like the uni nigiri, where the citrus took away from the uni's sweetness), and just got a little tiresome overall with its continued appearance. I wanted to like this place, having another option in the NT$2500 class of sushi restaurants is always a good thing. You could certainly argue that my issues amount to nothing more than nitpicks, but there were enough of them to add up to a less than great meal. 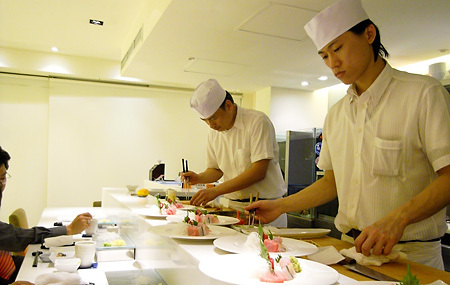 My pick for a NT$2500 sushi restaurant is 東丸. There's definitely potential for greatness here, though. When the food is good, and it is here, it can overcome a lot of problems. Also see my 壽司 Masa set on Flickr for photos and descriptions of various dishes from the meal.